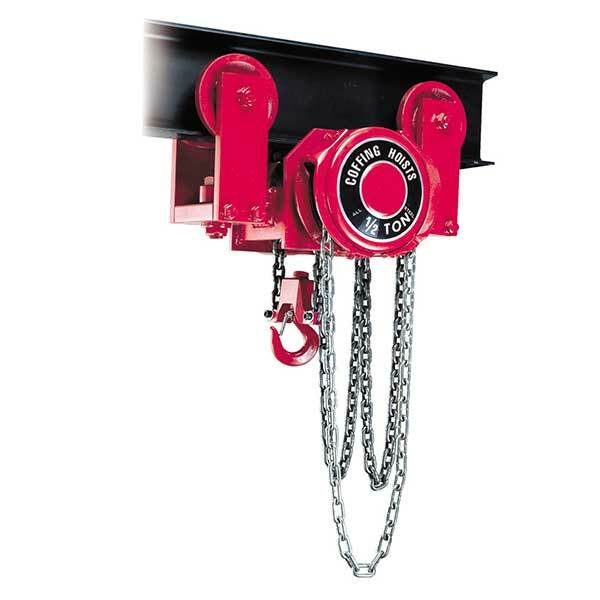 Coffing YLHA Model Hand Chain Hoist features a heavy duty, compact, swivel truck trolley hoist designed for true low headroom capabilities. Made to negotiate very tight radius curves. Dual articulating trolleys travel easily on curved beams. Extremely low headroom provides increased hook travel and maneuverability in tight places. Hoist and trolley are built for maximum strength and long life. Heat treated, alloy steel, planetary hoist gearing. Weston type load brake assures positive and efficient load control with minimal maintenance. Precision formed, cast steel pockets. Load sprocket can be reversed when a new chain is installed, providing extended sprocket life. Options – Wrap-around side plates available.